Greenhow Quarry (2.5ha) exposes significant mineral veins and provides a north-south cross-section of the Greenhow Anticline. Although the mineralisation is similar in content to the rest of the Askrigg Block, it has a distinctive style. It is due to this that it has been designated a Site of Special Scientific Interest (SSSI). 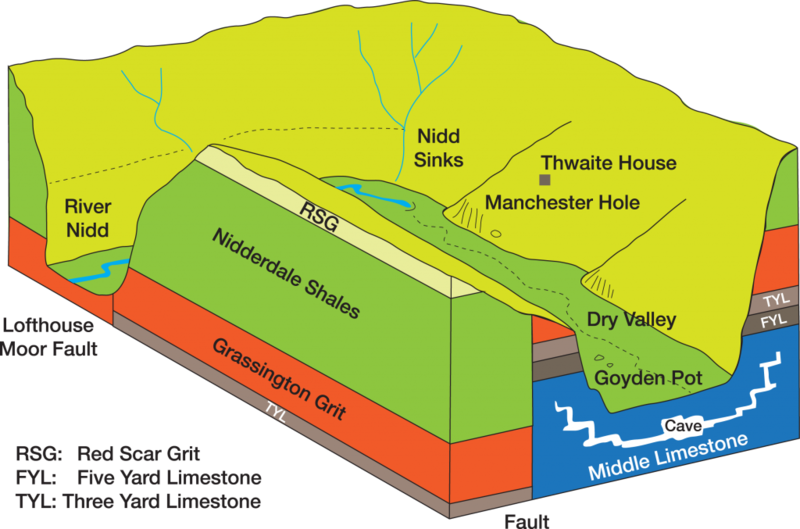 The 138ha Upper Nidderdale SSSI centres on the underground course of the River Nidd, and consists of four areas: How Stean, Limley, Nidd Heads and Blayshaw Gill. The River Nidd disappears underground at Nidd Sinks, Manchester Hole and Goyden Pot to reappear three kilometres downstream at Nidd Head Risings. The river flows in large passages at the exceptional depth of 30 metres beneath the valley floor, with, uniquely, the cave originating in one limestone outcrop then emerging from another, having passed below a sandstone outcrop. At How Stean Gorge, a combination of river and glacial meltwater erosion has produced a spectacular gorge in the Middle Limestone, together with caves, including Eglin’s Hole and Canal Cave. At Limley, a triangular area of Middle Limestone has been exposed as a result of three intersecting faults.